ThorntonWeather.com will be posting each of these messages as a service to our readers. Please check back daily for a new topic. Today’s topic during this Flood Safety and Wildfire Preparedness week is flash floods. Flash floods are no strangers to Colorado. Since the year 1900, nearly 300 people have been killed in flash floods across the Centennial state. In terms of lives lost, the worst flash flood occurred on July 31, 1976 in the Big Thompson Canyon between Estes Park and Loveland. A nearly stationary storm produced around 12 inches of rain in 4 hours, claiming 144 lives. In 1904, just north of Pueblo, a bridge failed and around 100 people drowned when a passenger train plunged into Fountain Creek. The 1997 Fort Collins episode drowned 5 people and caused 200 million dollars of property damage. In 2013, 9 people drowned during the historic September rain episode, which was a combination of flash floods and river floods. These floods were much more extensive than the Big Thompson Canyon flood of 1976, but because of timely and accurate warnings, many people stayed out of harms way and lives were saved. 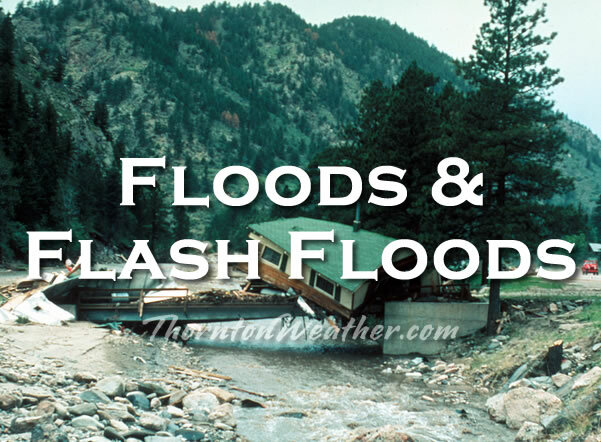 A flash flood is defined as a rapid rise in water levels, generally occurring in less than 6 hours, along large creeks, normally dry washes, arroyos, or over normally dry land areas, and can occur with little advanced notice. Flash floods frequently result from high rainfall rates, and infrequently result from dam failures, levee failures, or sudden breaks in river ice jams. Flash floods are very destructive, due to the force of the moving water, and the accompanying debris. This tremendous force can easily damage or destroy roadways, bridges, and buildings. In recent years, Colorado has seen major flooding and damage when heavy rains have occurred on wildfire burn scar areas. If you are in or near a burn scar area, you need to plan ahead. Be aware of general flash flood plans and procedures that have been developed and implemented by your local emergency management officials. You should know your flash flood risks, and make your plans to save your life and those around you. The National Weather Service forecast offices will discuss flash flood potential in daily hazardous weather outlooks, and in graphical weather stories on National Weather Service forecast office web sites. During days when flash flooding is possible a Flash Flood Watch will be issued. During days when flash flooding is likely or occurring, a Flash Flood Warning will be issued. When a Flash Flood Warning is issued for your area, you need to act quickly if you are in a drainage area or in other low spots. Know your escape routes to higher ground and act as quickly as possible. It may be just a short walk or climb to that higher ground. Many flash flood deaths occur in vehicles. Do not drive through a flooded roadway. The water may be much deeper than you think, because the roadway may be damaged or washed away. One to two feet of water will carry away most vehicles. Instead turn around, do not drown. This entry was posted on Wednesday, March 6th, 2019 at 3:04am MDT and is filed under Weather Education. You can follow any responses to this entry through the RSS 2.0 feed. You can skip to the end and leave a response. Pinging is currently not allowed.